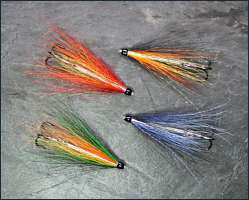 Recent years have seen the development of many and varied innovative salmon fly designs. 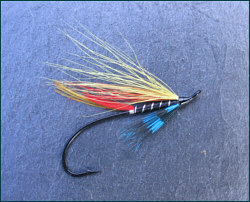 Today's salmon fly fisherman has a great many weapons in his armoury, ranging from simple single, double or treble hooks, short or long in the shank, barbed or barbless; snakes and needle flies; coneheads, bottle tubes and turbo discs. The tube fly has long been a favourite of many fly tyers, available in a variety of materials, such as plastic, aluminium, copper and brass, allowing flytyers to make tube flies in a useful range of lengths and weights to suit most river conditions. Another great advantage of the tube fly is its durability, as the hook, whether single, double or treble, can be easily replaced when damaged. A new range of ultra slim tubes have been developed in Scotland by Grays of Kilsyth. These very fine, plastic lined, needle tubes, made from high quality stainless steel tubing, as used in hypodermic needles, allow the salmon fly tyer to make extremely slim salmon tube flies. I list below a few articles relating to Salmon Flies, particularly salmon fly tying and salmon fly fishing, mainly in Scotland. 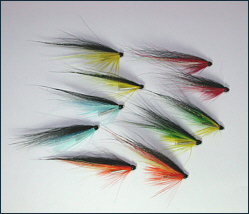 I list below just a small selection of some of the most renowned traditional Scottish salmon flies, spanning more than a century of Scottish salmon fly fishing. One of our most successful low water patterns, sparsely dressed in the style of A.H.E.Wood, tenant of Cairnton on the Aberdeenshire Dee from 1913 to 1934, during which time he killed 3,490 salmon, most of them on the greased line. 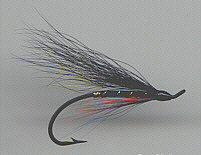 The Logie was also a favourite salmon fly of Frederick Hill who, during the nineteen forties, was gillie to Captain H.T. Musker at Carlogie, another good low water beat on the Dee. In "Salmon Fishing", 1948, he wrote, "From the beginning of April onwards, the Logie is one of our most deadly flies." The tying shown is the generally accepted dressing and Hill's preference for early season, fished on a size 4 hook. Tied on a size 1 hook, it was his favourite for high and coloured water. 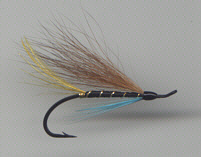 The Jeannie is another low water salmon fly, whose popularity, like that of the Logie, Blue Charm and Silver Blue, has spread far beyond the Dee, where it originated. Another of Frederick Hill's favourites for the early season, again fished on a size 4 hook. 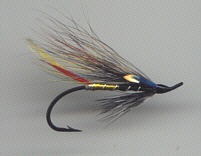 Originating on the Spey, Munro's Killer is a widely known and enormously successful salmon fly. A modern hairwing dressing named after J.A.J. Munro, who for many years operated a fishing tackle shop in Aberlour. 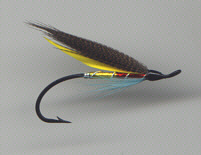 The most famous of all salmon flies, created in 1845 by Jock Scott, (born in 1817 at Brankholme) who, for twenty five years, served as Fisherman to Lord John Scott of Kirkbank on Tweed. A successful fly, not only in Scotland but also in Nova Scotia and New Brunswick in Canada, in Spain, Iceland, Finland and Norway. Indeed it was on a voyage to Norway that the first Jock Scott was tied. Sir Edward Grey, in "Fly Fishing", said of the Jock Scott, "the best all round fly, excellent for all seasons, weathers and waters in Great Britain, and to be used of all sizes. 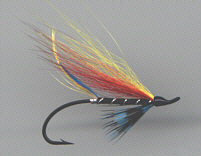 I believe the Jock Scott to be the best blend of colour that has ever been invented for a salmon fly." High praise indeed. 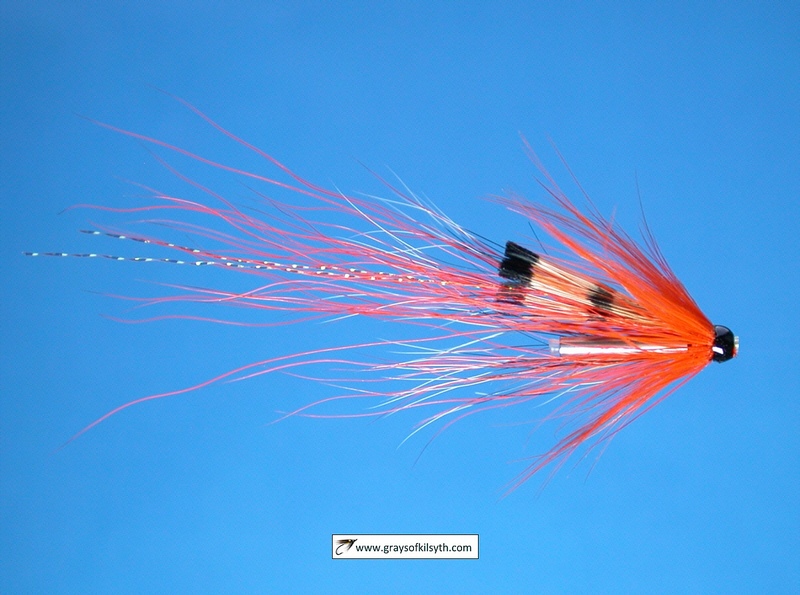 In the words of Hugh Falkus, "Of all hair-wing salmon flies for late spring and summer fishing with floating line, the simple Stoat's Tail is one of the best we have." 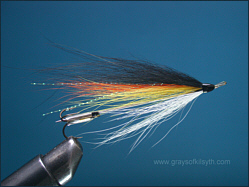 This fly has been around for a long time and has in all probability accounted for more salmon than any other fly, particularly if we take into account its many variants. Some have an orange hackle, as in the Thunder Stoat and Stinchar Stoat; some a touch of blue, as in the Sweep; Others sport a tinsel body, as in the Silver Stoat and Black Brahan. All can be relied on in a wide variety of conditions and most salmon fly boxes would contain one or two variants, according to preference and experience. 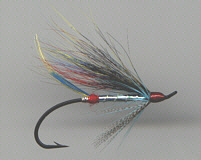 The Silver Doctor is a very attractive salmon fly, in common use from the mid nineteenth century on the Tweed and other border rivers. Attributed to James Wright, of Sprouston, though some believe it may have originated in Ireland, together with other brightly coloured patterns of the time. Whatever their origin, the popularity of such gaudy flies grew and they soon ousted the rather drab Scottish creations previously in vogue. 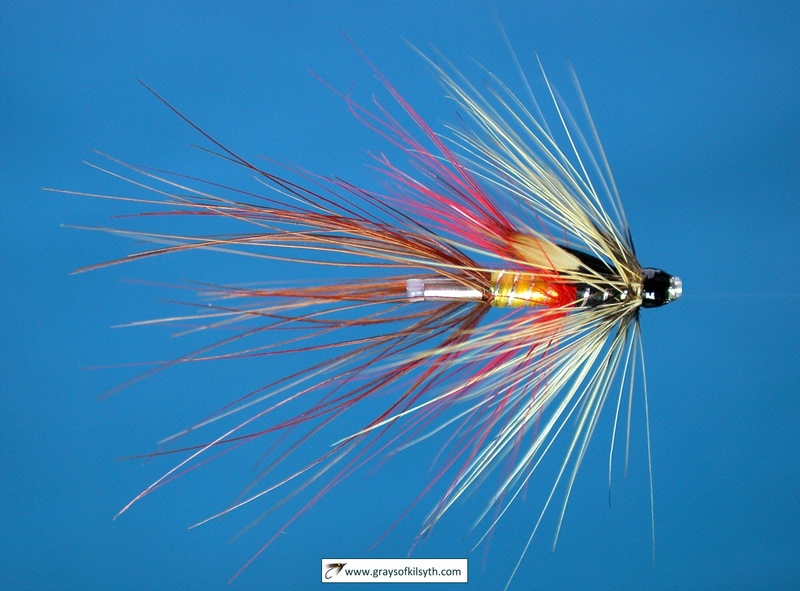 As a hairwing pattern it is extremely effective and, a century and a half after its creation, it retains its well-deserved place in many a fly box. 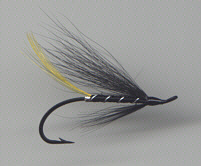 The Hairy Mary is one of the earliest hairwing patterns, dating back to around 1950, when it was in use on northern rivers such as the Ness and Conon. Its design is attributed to Johnny Reidpath, an Inverness tackle merchant. 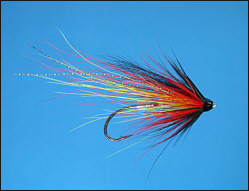 In its simplicity, this fly is in marked contrast to the highly complex creations of the previous century, yet no less effective in luring salmon. Known also as the Garry Dog, Yellow Dog or Minister's Dog, the name originated in a Tweed tackle shop of the 1920's, where a visiting minister contributed some hair from the tail of his dog, a golden retriever named Garry, to aid the completion of a fly under construction on the premises. 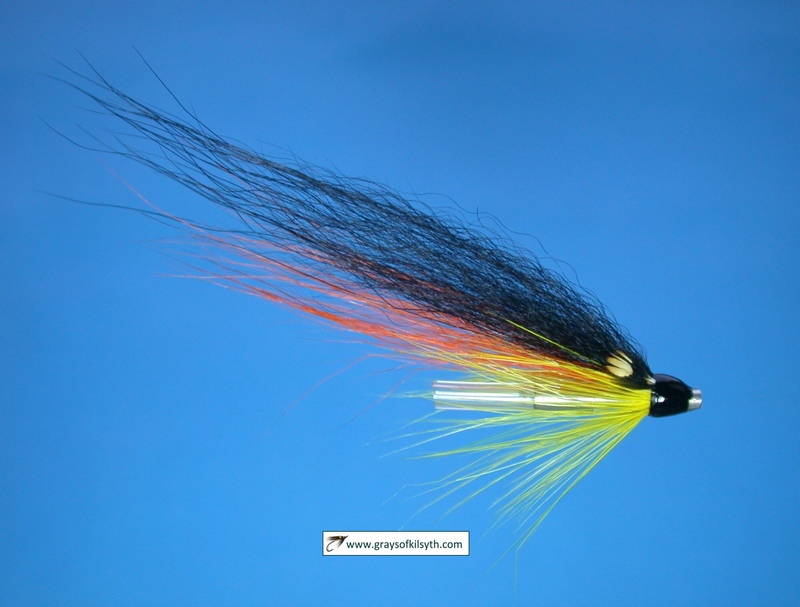 While yellow bucktail or similar hair is now substituted for the dog's hair, the Garry remains an excellent salmon fly pattern for coloured water, particularly in the autumn.